After the wiring on the side of the house was fixed and I actually got a connection like I was supposed to, the speed is exactly as promised by contract: 3 MBps. 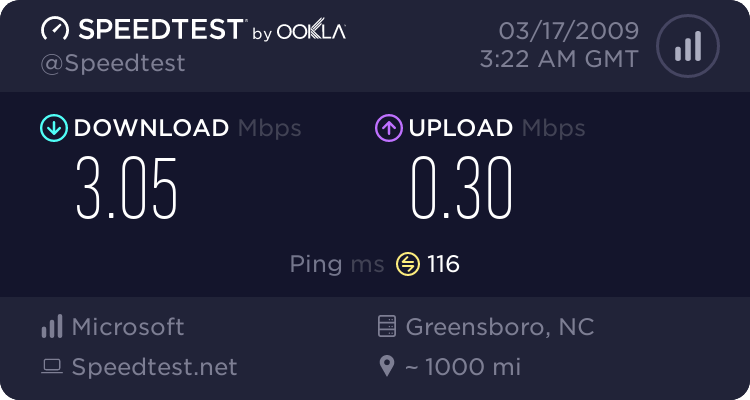 Supposedly, since it's a dedicated line, the speed will not fluctuate with my neighbours' use, even if they all switched to DSL. Novice school done! Ready for autocross! Gee, where did half this woman's back go? Open source car design FTW!